I titled this post "Brewing Kombucha" but could have titled it "Kombucha: From a Non Expert" so know that I'm just learning this as I go. What I'm sharing here is just what has been working well for me. For the quick and easy directions to print out, click here. I started with a hunk of scoby in about 1 cup of home made kombucha from someone who offered it on our local Buy Nothing site. I jumped at the chance to stop spending around $4 for my favorite beverage. This is similar to how I received mine but these are the ones I'm giving to my friends now that my scoby is huge. I brought 5 cups of water to a boil and added 1/3 cup of organic white sugar to it. 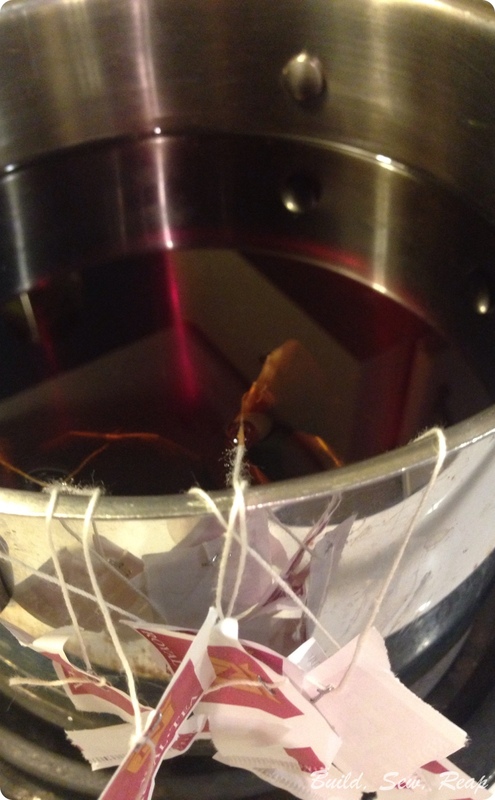 Then I dropped in 6 black tea bags and let it steep until it was room temperature. 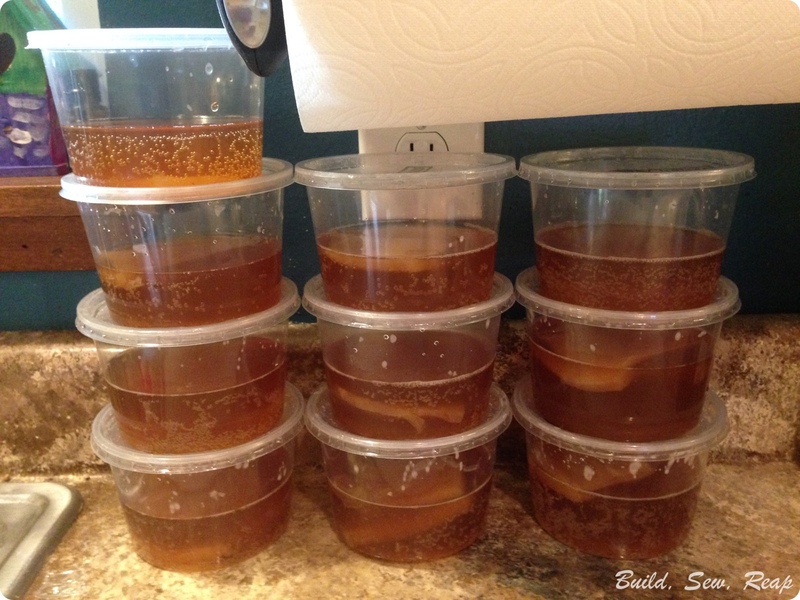 You don't want to burn the good bacteria when you add it and your scoby together. I read not to try to use herbal teas or really anything except cane sugar and black or green tea. The herbal teas have oils from their herbs that might interfere with how your scoby works. I poured my tea and my new scoby together into a glass container with a spout. My spout looks metal but it isn't. 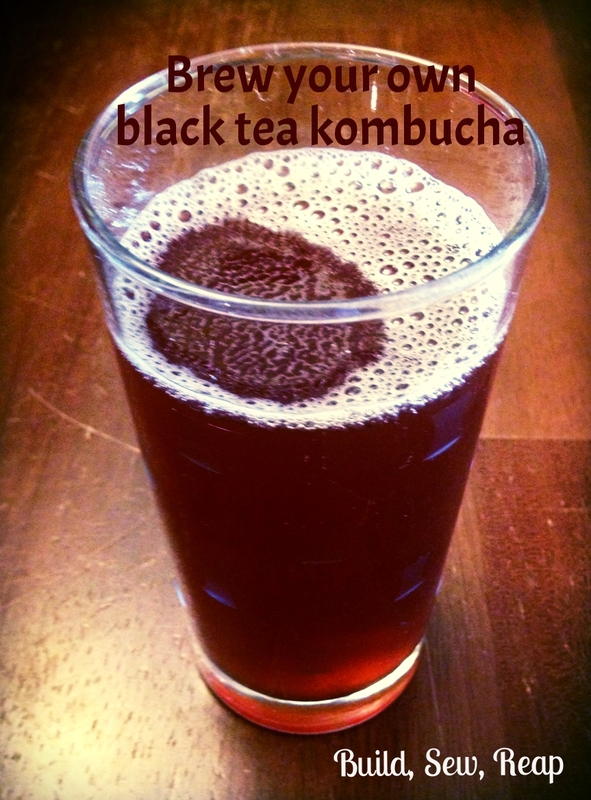 I read that you should keep all metal away from your kombucha once it starts to brew because the metal will react with the bacteria and make it taste weird. (Technically this isn't a picture from my first round but it looks similar. I used a rubber band to hold a clean cloth napkin over the top. Please note: I don't use fabric softener and while this doesn't ever touch the kombucha, I would recommend that you make sure the cloth you use is as free from chemicals as possible. I waited about a week before transferring to secondary containers with juice for a second fermentation but you can wait longer or not do a second fermentation at all. This is all preference, taste it and see what you think. If you don't have a spouted container, the best way to taste it is to take a straw, dip it a couple of inches into the liquid (past the scoby, you won't hurt it) then put your finger over the top of the straw and draw it back out. Release the liquid into a cup or straight into your mouth. Also, keep in mind that once you really get things moving and your scoby grows and grows, you can do much larger batches and get far enough ahead of your consumption to let it ferment longer. 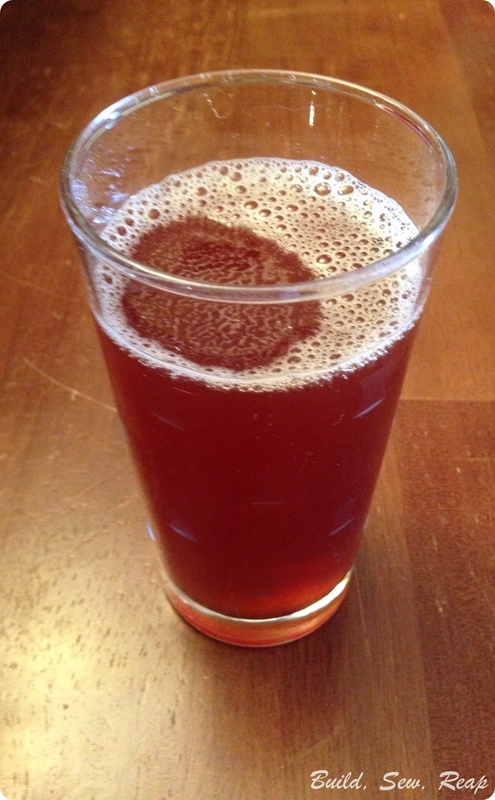 For the second fermentation, I used about a 1:5 ratio of fruit juice (pomegranate has been my favorite so far even though I don't really like it by itself) to kombucha tea. I also learned that you get a much better fizz if you a) put in a few matchstick size pieces of fresh ginger and b) you leave a bit of space at the top of your container. I haven't seen this recommended in any of my reading but I also started cutting off a small chunk of scoby to add into each jar for this fermentation. You can't ever put this scoby back in with the big one though, you don't want to introduce the juice sugars into your initial fermentation container. 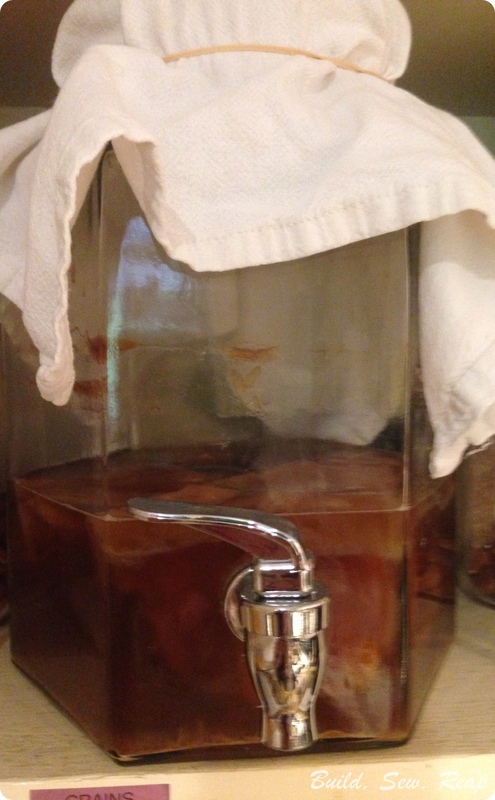 Leave a cup or two of kombucha and the scoby in your big container. You use this as the starter for your next batch. 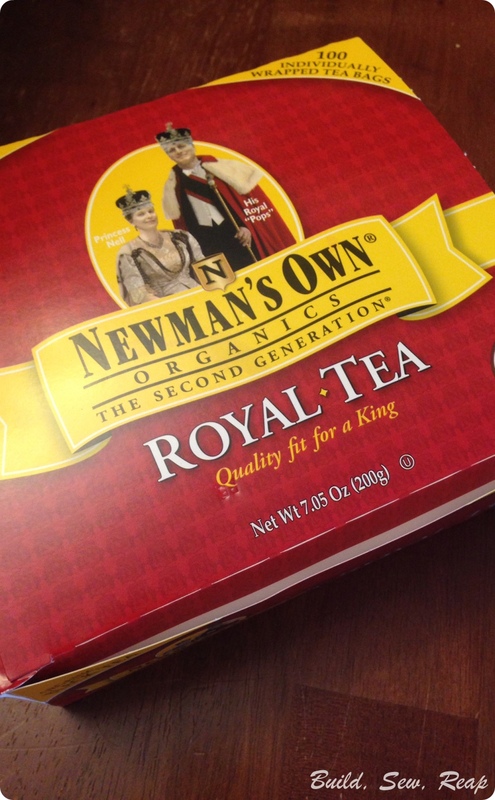 In fact, you can start your next batch right away, just add new sweetened tea to the big container and brew away. I mark dates and ingredients on each one (oops, forgot what I put in the one in the jar here) so that when I taste it later, if I like it, I know how I made it. I leave these up on a nice high shelf in a kitchen cabinet for at least another week. I also periodically open each lid to let the gasses out. I think this lets it get fizzier but haven't really tracked what this is doing for the process. I've had good results so I assume it's doing some good. **UPDATE: I let the fizz out of one to transfer to a portable container and it never got fizzy again. I'm going to stop burping my containers and just go straight from second fermentation in the cabinet to fridge (I like ice cold kombucha) to my glass without opening it until I'm ready to consume it. I like my kombucha ice cold so when I like the flavor and fizz, I transfer it to some saved bottles from my old store bought kombucha habit and keep it in the fridge. UPDATE: See comments above about cutting out the step where I move the liquid after second fermentation to drinking container. I'm going to skip that and not open a container from the start of second fermentation until I'm ready to drink it. Second fermentation still needs to happen outside the fridge but once I think it's likely done, I'll move it into the fridge without opening it. When I want a cold fizzy treat, it is right there for me to enjoy ... and it doesn't cost me $4. Mmmm, look at the fizz on that!! 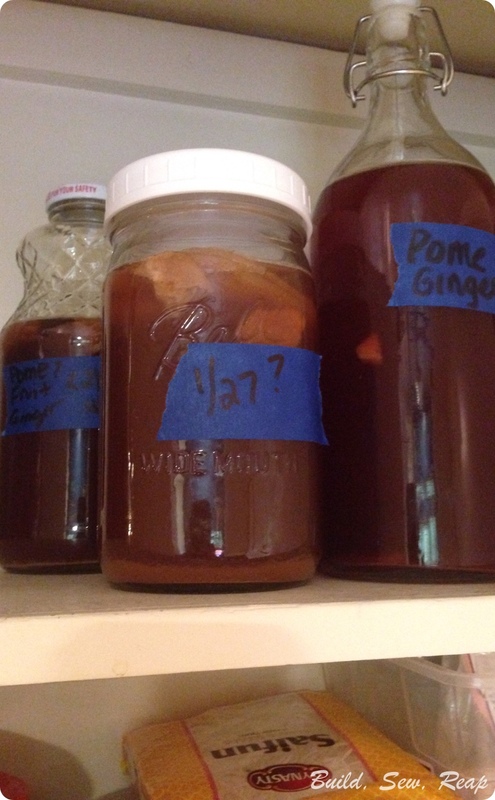 Your initial fermentation should just be sugar sweetened tea, no juices or ginger or anything else. Black spots are bad, dark brown is probably ok. Examine any weird spots you get, if they look moldy, it's probably best to scrap the batch and start with a new scoby. Brown stringy things hanging from the underside of your scoby are fine. I think that's yeast or something. When you transfer the fermented tea out of the big container into smaller ones for drinking or for a second fermentation with juice, leave about a cup of it behind and just add more sweet tea to the container. I've done at least 5 batches and still haven't cleaned out the big container. FRESH ginger appears to make the beverage much fizzier during second fermentation. Don't try to use the ground ginger from your spice rack. It's disgusting and doesn't make things fizzy. Leave a bit of space at the top of your containers in the second fermentation. Don't try to use too much juice, start small. The flavor seems to go a long way. Label your containers, you'll be so glad when you find something you like and you know how you made it. I think that's all I know about kombucha. There's a ton of information out on the web so google around to see what else you can learn. If you figure out any great tips, please comment here to share with me and fellow readers.